UN Environment Programme Finance Initiative (UNEP FI) and Finance for Tomorrow, an initiative of Paris EUROPLACE, joined forces to stage three days of action on sustainable finance in the city where decisive action on climate change was finally taken in 2015. The 4th Climate Finance Day and the UN Environment Finance Initiative’s biennial Global Roundtable were held in Paris from 26-28 November 2018. Finance for Tomorrow and UNEP FI co-organized their two flagship events which together were the major global rendez-vous in 2018 dedicated to mobilizing the financial sector to deliver a sustainable financial system. 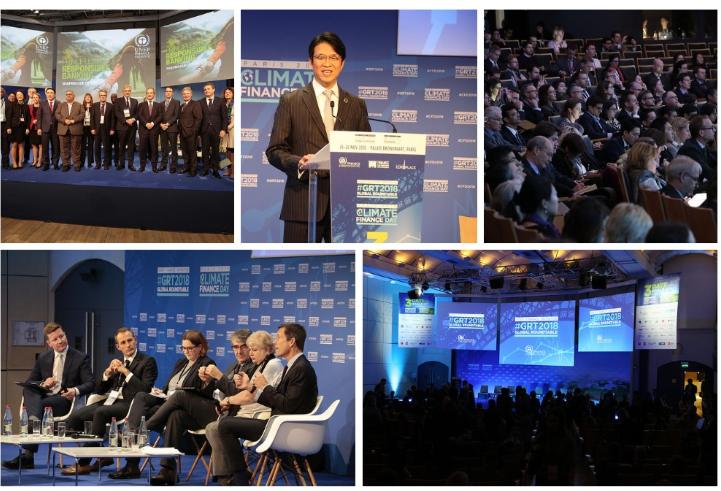 A huge thank you to the 1000+ delegates and 140+ speakers from 47 countries who participated in the event, making it one of the biggest sustainable finance events in 2018! You can find highlights from day 1 and day 2 on the UNEP FI website. You can also find photos from the Global Roundtable here and Climate Finance Day here. We look forward to welcoming you to the 5 Regional Roundtables in 2019– in Africa and the Middle East, Asia Pacific, Latin America and the Caribbean, North America and Europe, to showcase and accelerate sustainable finance in your regions.